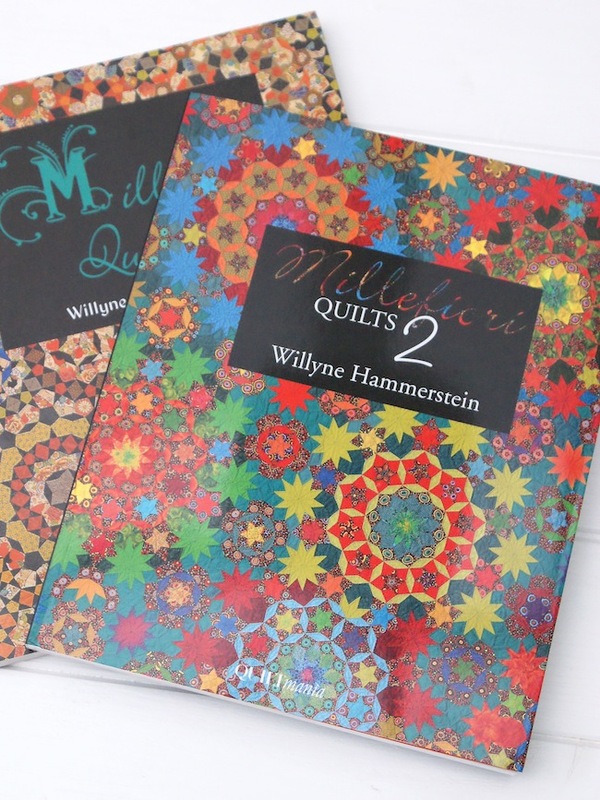 Willyne Hammerstein has been much talked about in recent years with the huge popularity of her 'La Passacaglia' quilt from her debut book Millefiori Quilts. 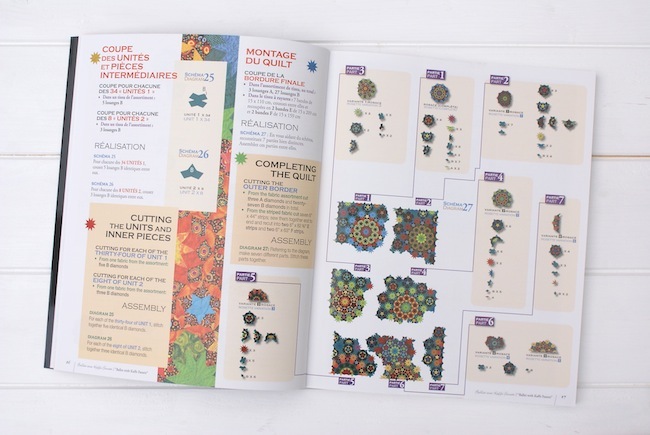 Her global-spanning fan-base will be delighted to hear of her brand new book for 2015, simply named; Millefiori Quilts 2. 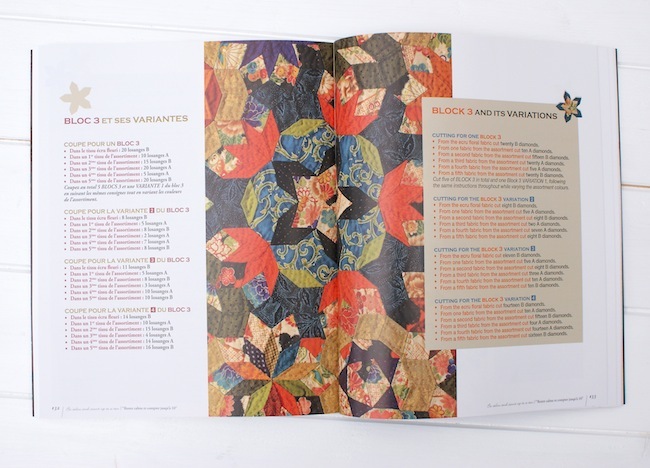 If you were in awe of her first book with the incredible array of kaleidoscope and geometric English Paper Pieced quilts you will be equally blown away - perhaps more so, by this new book. Willyne hails from the Netherlands, with a long-standing career in law. Like many of us can relate to, she picked up the quilt bug after visiting several quilt shows, markets and shops and found the time to sew while travelling for work. 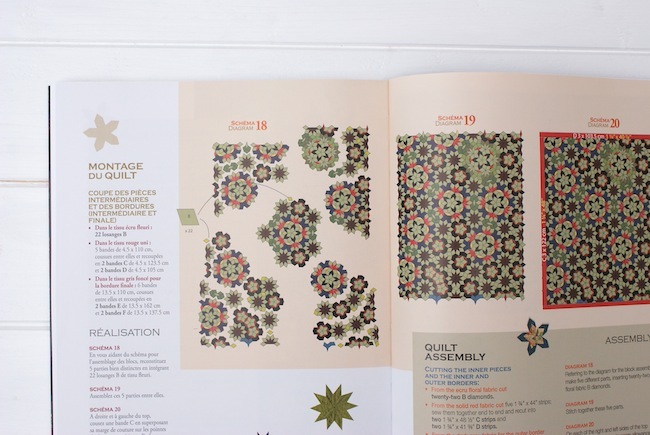 It was great to read about her reaction to all the La Passacaglia quilts that been inspiring quilter's worldwide, which spurred her on to design and create again. Though I was saddened to read that this might not have been the case as she suffered a cycling accident in 2013 and spent many months in rehabilitation with a shattered left hand and wrist. Very fortunately she recovered, and used her time wisely in-between her sewing hiatus to work on even more new patterns for the book. So, back to this new Millefiori Quilt's 2 book! It's really a delight. I have spent many hours pursuing the book and studying the blocks, while blurting out loud every so often, "Oh my gosh", "Wow!". The cover star winner on this book is 'Ballet' - which I'm very pleased about as I find it a lot easier to pronounce than the previous 'La Passacaglia'. Pronounced - 'pas-a-cal-ya'. It's another stunning kaleidoscope pattern that will surely win the hearts again of quilters everywhere. Dare I say, I think I even prefer Ballet to La Passacaglia?! Yes. I think I do. It has beautiful harmony between the larger rosette's and those larger stars really stand out and bring it all together beautifully. There are 17 quilts to feast your eyes on in total. I love the names she uses for the quilts; 'Staphoster Snotterkapjes', I'd love to know what that means? With each quilt pattern, the blocks/rosettes/cogs are broken down section by section so you can digest these complicated looking designs down into manageable pieces. The tough part is not the tiny pieces I imagine, it's getting these larger pieces all joined together seamlessly. There are templates to trace the shapes at each chapter. Willyne also had more simple designs such as 'Old Dutch' which you can create with English paper piecing using an 8-pointed diamond template. 'Sunrise', which uses square and triangle variations - as well as others. I think the scary thing for a lot of people is scale. They are large quilts, which we all know is quite an undertaking. But don't be put off, manage what you can and scale down the quilt size to make it more realistic to finish if that's what you need. I have my own long running 8-point diamond EPP quilt that's been in the works for a number of years! now, it get's picked up and dropped down again in between life, real-work, the shop, work sewing, the blog and other personal sewing projects, but it's always there when I need it. My head is filled with sewing dreams and motivation now so I'm off to do some! I hope this has given you a little inspiration for the weekend. If you wanted a copy of the latest book you can find it here at Sew and Quilt. Though, be quick as we only have a handful of copies left! 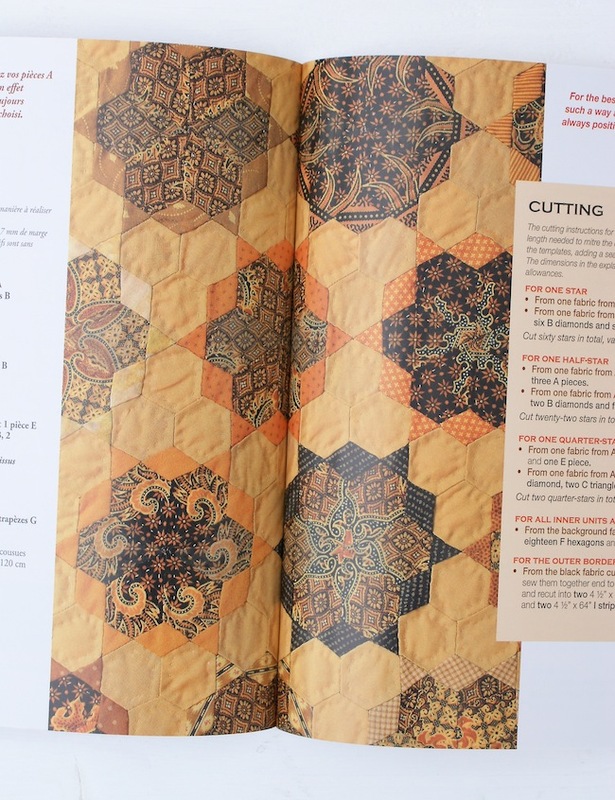 We also have the first book in stock if you need to get up to speed ;-) Don't forget as well, we have Sew and Quilt La Passacaglia English Paper Pieces in stock now. I just read an interview in Dutch with her on sew.eu and there she says she worked as a lawyer for 41 years, 25 years of which for the Nijmegen university in the end also as a lecturer/professor. In that period she also worked as a judge and an appeal judge at several Dutch courts. She was appointed to the Dutch Council of State in 1994 and left in 2010. Such a career. And such interesting and beautiful quilts. The book looks wonderful. Thank you for sharing some info on Ms. Hammerstein's newest offering! So gorgeous & looks like there is a myriad of inspiration! Amazing quilts! She's the perfect example of just doing--irregardless of the mundane tasks of life. She clearly had a very busy professional life, yet she started down a daunting path of full sized EPP quilts. Talk about inspiration! These quilts are amazing, and it just goes to show how hand sewing can be a great way to relax while away from a stressful busy job! This book is definitely going on my shopping list! Thank you for such a thorough review. My pleasure Louisa. Hand sewing is a great de-stresser isn't it? Hope you get a copy of the book. Staphorst is a town, and I think that snotterkapjes are pieces of traditional dress that many people wear there. Willyne is my Dad's cousin's wife. She's very talented! Do you know if and when you'll get it restocked? I was too late, but would love a copy of Millefiori 2. Ballet will not leave my mind, I've even started dreaming about it…. The Millefiori quilts fascinate me and I have started mine. I enlarged the templates by 25% and a local scrap booking shop precision cut 200 sets of templates as I like to use thin cardboard. I have ordered another 200 sets! One Saturday afternoon my brother cut about 500 of the small triangles, he made it look very easy! I needed a lot more triangles than the other shapes. Most enjoyable to do but it takes time. Wonderful that so many quilters are hooked on this, all will look very different when completed. Hi. Any idea as to where I can purchase these books?